I’m still using Bydureon to manage my diabetes, along with Metformin and a reasonably balanced diet. I’ve just been told that the current vial and syringe arrangement that I have to use is about to be changed to a pen unit similar to the one I used with the Byetta. Until I see the replacement I’m not sure how I feel about this. 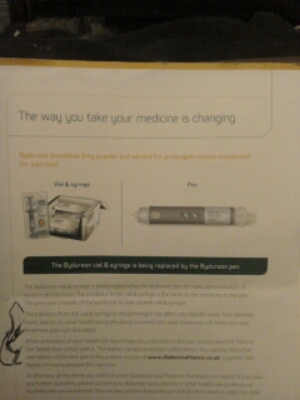 The leaflet I’ve been given suggests a straight one dose per pen, but that may just be the language being used to reassure me that the medicine and dosage in this new packaging will be the same. Being generally needle-phobic, the statement that the pen uses a needle of the same size as the existing one does not exactly fill me with wild exuberation. That said, it will almost certainly be easier to set up and use these new pens. The insulin and byetta pens were simple and effective, and I’ve screwed up enough injections with the current arrangement to appreciate anything that saves me a bit of pain. Oh well, we’ll see when the swap over happens. This entry was posted in Diabetes, health, medication and tagged Bydureon, diabetes, health, medication, pen injector. Bookmark the permalink.